I have several solar cookers. Some were store bought and some home made. The two that I use most are the "Solar Burner" parabolic cooker, which I use almost very day to boil water for my morning coffee, and a SHE Hot Pot, which I often use for making soups, stews and other slow cooked foods. 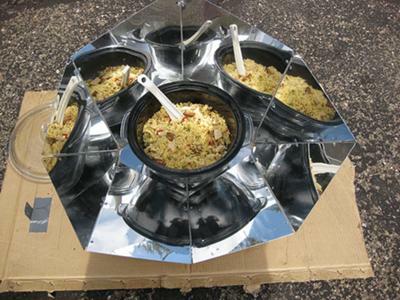 The Solar Burner functions like a stove top burner. It gets very hot very quickly, and can be used to fry, boil, simmer and saute. One of its nicest features is the ability to use regular pots and pans with it. I can cook most anything I want in well under an hour on the Solar Burner, and I can boil a quart of water in about 10 minutes. The Hot Pot is more like a crock pot or slow cooker. I can put several pounds of meat and vegetables in it, and they'll be completely cooked in several hours. It works very well as long as there are 3 - 4 hours of sunlight. I also have a Copenhagen cooker, which is also a slow cooker, and a home made Fresnel lens "grill." I am still getting familiar with the Copenhagen, but I think I will like it once I start using it more. I used the Fresnel Lens cooker a lot until I got the Solar Burner, which I find to be faster and more practical to use. I'm not much of a baker but would like to buy a Global Sun Oven, or build a similar 60/30 box oven one day. Thank you for your opinions and thoughts on these solar cookers, you are building up quite the "arsenal", I am sure this will be helpful to others in making their decisions on what cookers will best serve their purposes. My experience has been very similar to yours. I started with a GSO, and loved cooking chicken, brownies, and biscotti with it. After being exposed to the ASSC design, I ventured into making my own panel cooker, enjoying the challenge and mathematics involved. My entries to this website earned me a Hot Pot Cooker, in which you're making your Paella. The HPC is a fantastic little cooker for rice based dishes and it's ease of use results in excuses being made to "put it in play". I bought a parabolic, and it has come in handy when a house full of people want eggs...not even my stove top cooks faster. This weekend we had a party and I had the GSO in the backyard cooking brownies, then chicken, then just sitting in the setting sun reminding everyone that it could have cooked at 300-350F all day long, pot after pot, no batteries required. My theory is that energy will be valued even more greatly in the future, and those that understand how to personally use it, will be greatly rewarded. I have a homemade solar box oven. Temperatures average about 250 degrees. It bakes bread perfectly fine. It takes about 2 1/2 to 3 hours to bake two full sized loaves.